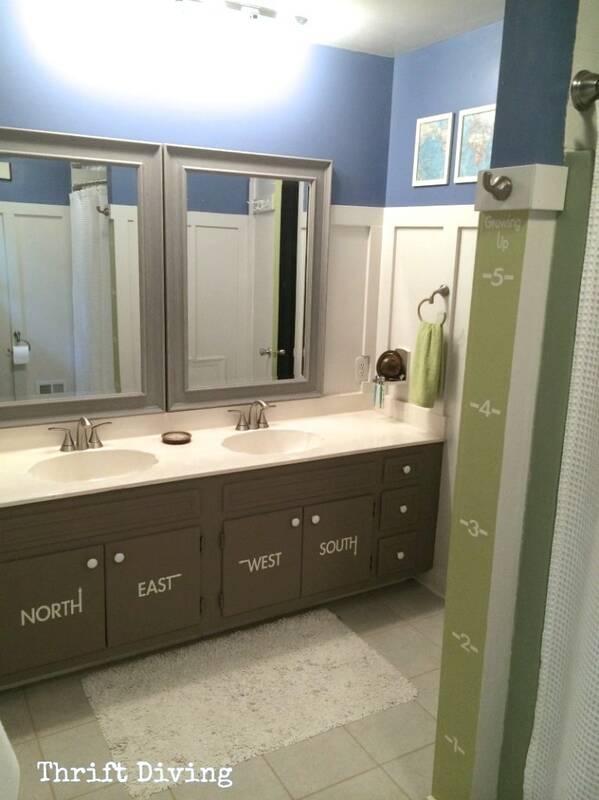 You are here: Home / Room Makeovers / Bathroom / BEFORE & AFTER: Kids Bathroom Makeover Reveal!! 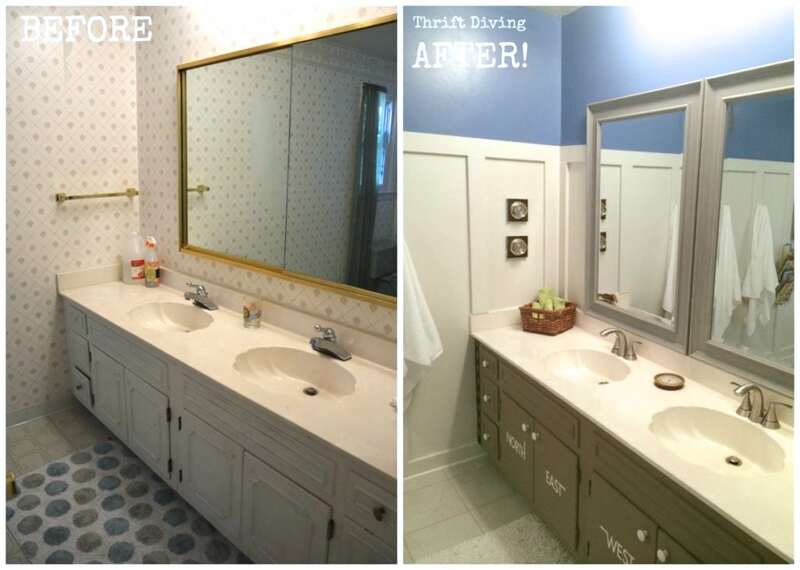 I’m excited to show you how a DIY superwoman can totally create a cute kids’ bathroom makeover when she gives herself 30+ days and a deadline. It’s going to be a rather long story, so kick up your feet, grab a drink, and let me show you what I am so proud to call my kid’s bathroom! This is the room I chose for one of my 30-Day Room Makeover Challenges30-Day Room Makeover Challenges, where my readers and I commit to transforming a room in our house in 30 days. These are the most fun and most exhausting challenges. Life gets in the way. You get tired. You get frustrated. You get stumped. But it’s a journey. I seriously couldn’t have done any of my room challenges without my readers. You guys ROCK. 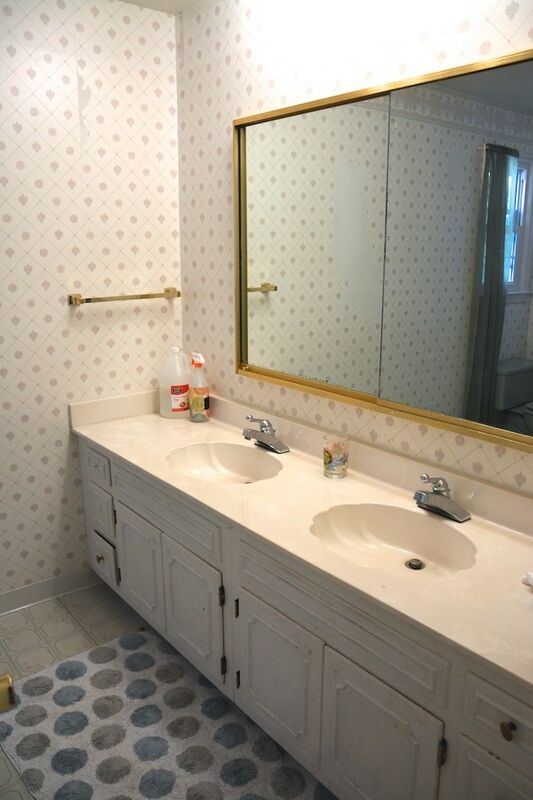 So let’s get started on this tour of my kids’ pretty bathroom! 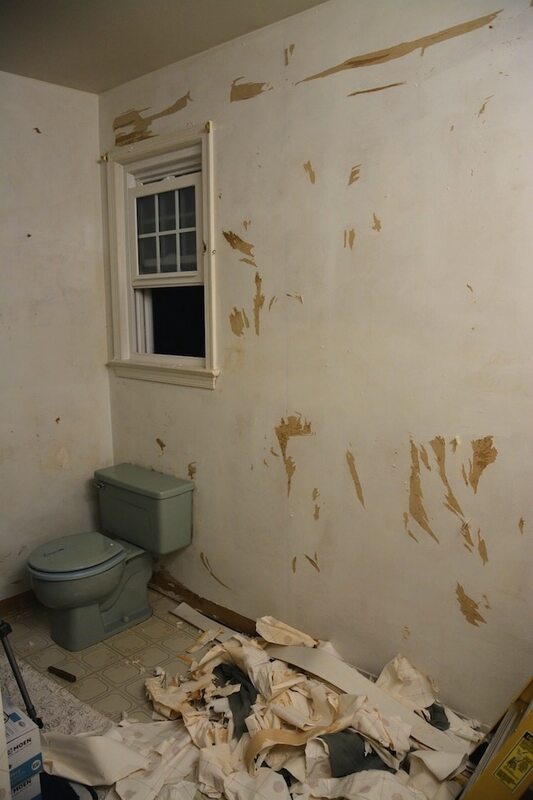 Well, that was what it looked like after I started removing wallpaper! It went from “bad” to “worse” in about 3 days. EEK!!!! Whatever the reason I put off making this room amazing for my kids, it’s no longer an issue :). This makeover was LONGGGG overdue! 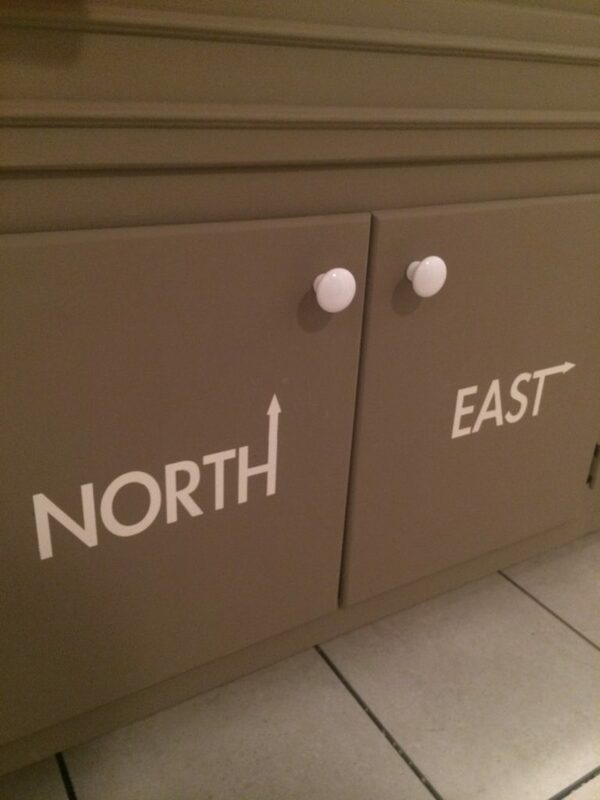 In this bathroom, I’m grooming their geography skills! 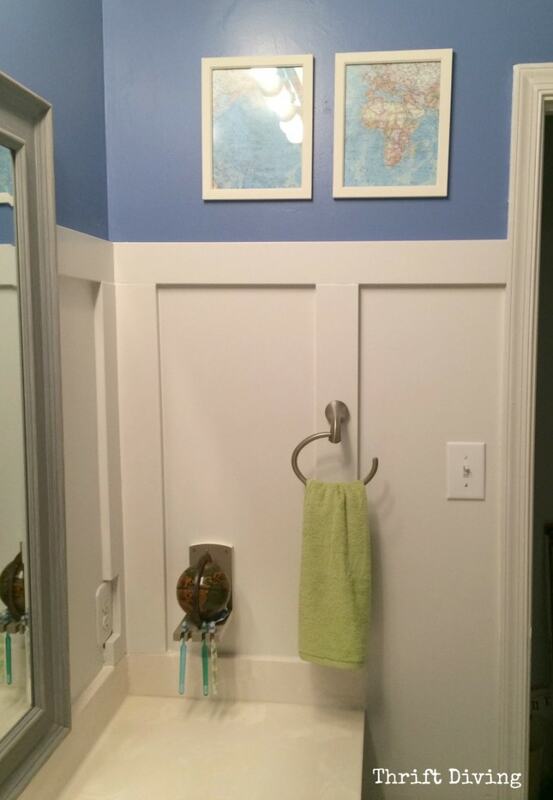 At first I thought I was going to do a “travel theme” in my kids’ bathroom, but honestly, I was stuck. Aside from buying old suitcases and stacking them next to the sink or hanging them on the wall, what was I going to do for travel?? I was drawing a blank! 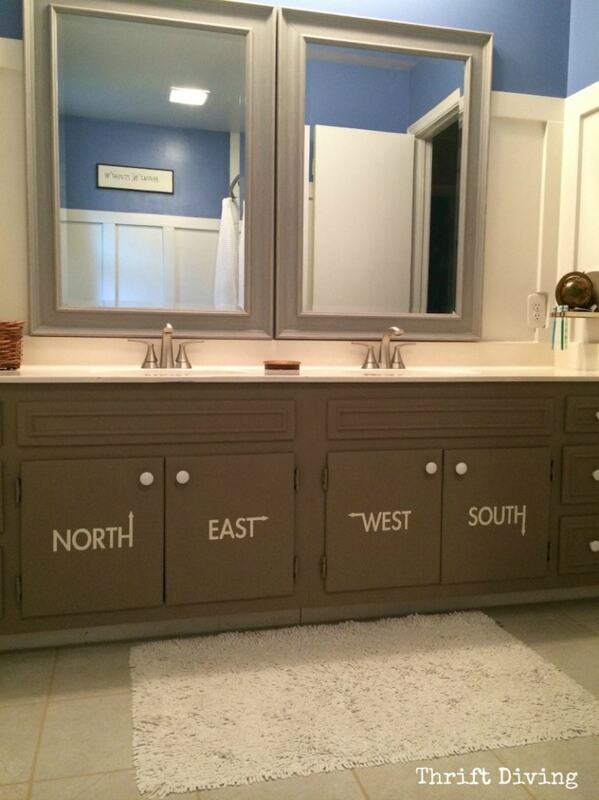 Even though I loved the look of a navigational theme bathroom, I still didn’t know how I was going to tie it all together. That was the hard part! 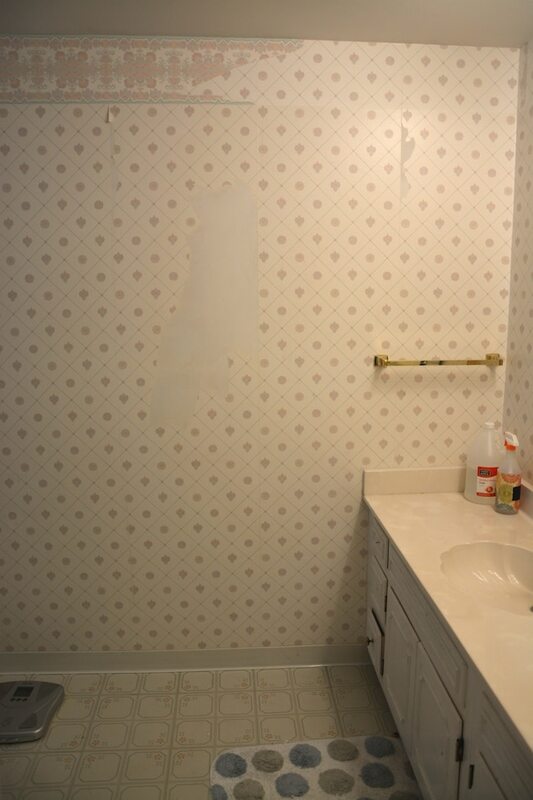 I went ahead and got started with removing the wallpaper and skim coating the walls. That was a huge job! You’d think as creative as I try to claim I am, I’m afraid of color. 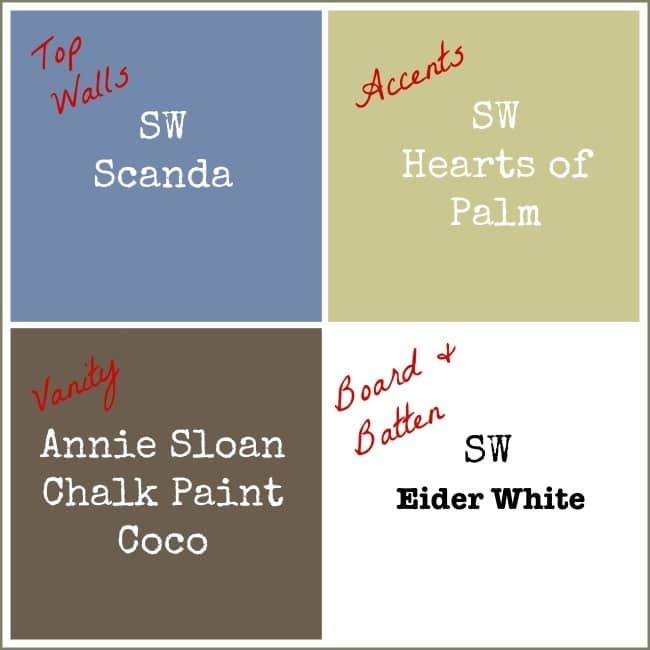 I tend to choose colors that are very “pastel-ly” because I’m afraid dark colors will make my house feel even more like a dungeon (we don’t get much light during the day in the spring/summer). I love light, airy spaces. 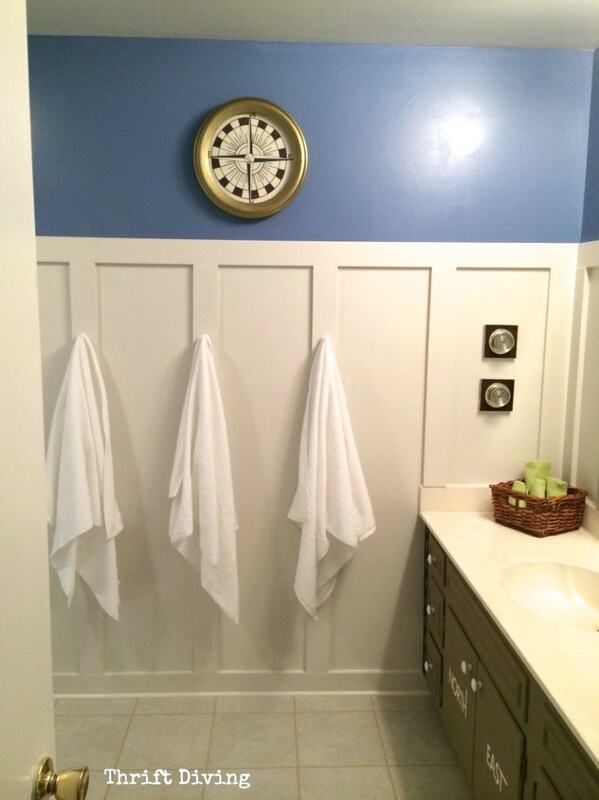 But since this was a boy’s bathroom, a little bit of deeper blue was fitting. And really, it wasn’t even “that” blue! I could see myself using these pretty colors again! 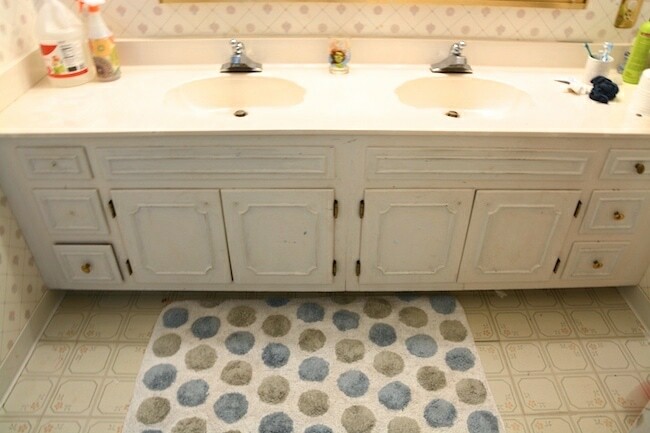 If you’ve been a reader of this blog for any time (or if you have boys), then you know that my boys’ bathroom was stinky. I couldn’t wait to lay down the SnapStone flooring to cover up the old stink after a good bleaching. 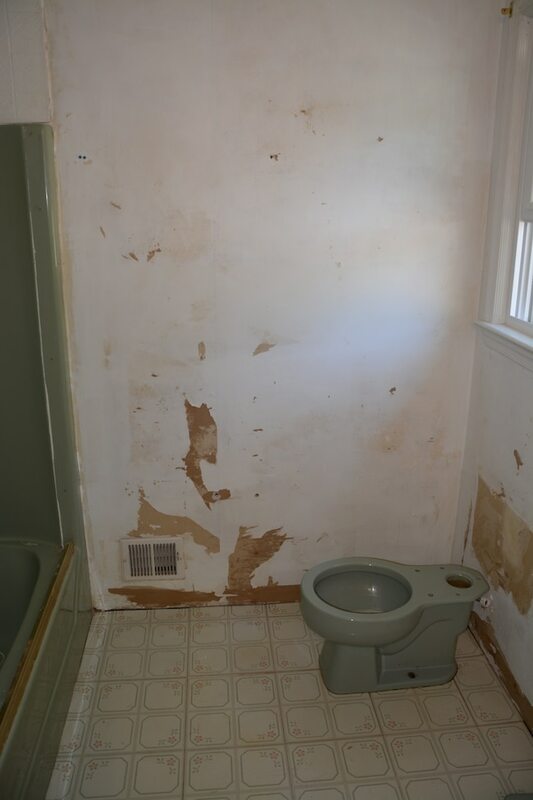 But first, I had to remove the toilet. (RELATED: Read my post on how to remove a toilet for step-by-step instructions. Then, you’ll want to check out my instructions for how to install a toilet yourself without a plumber.). 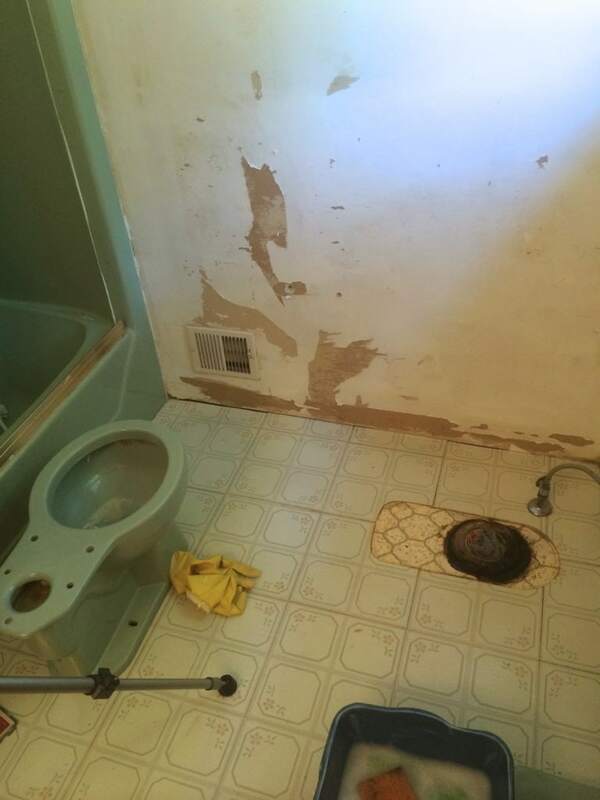 You can watch briefly some footage from me working on this bathroom. 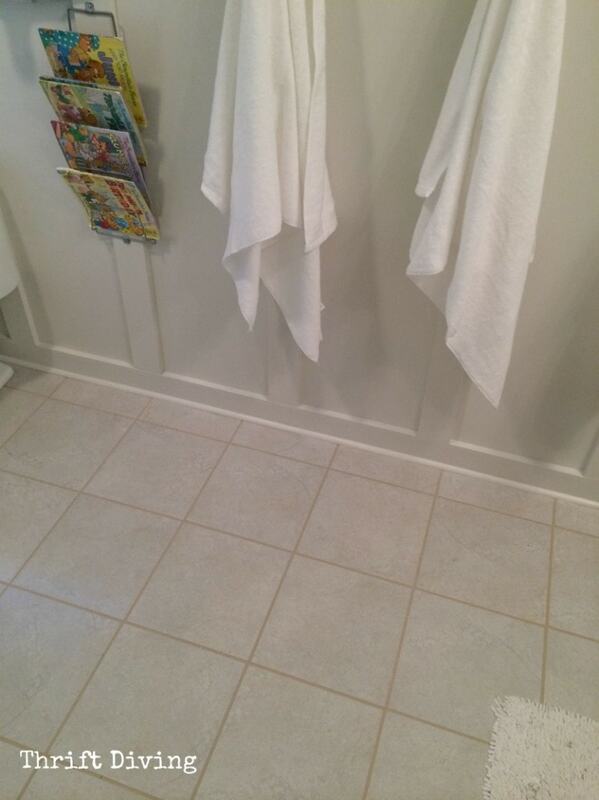 I had used SnapStone for my laundry room makeover from a previous room challenge, and I had about 7 boxes left. I had to buy 6 more boxes. 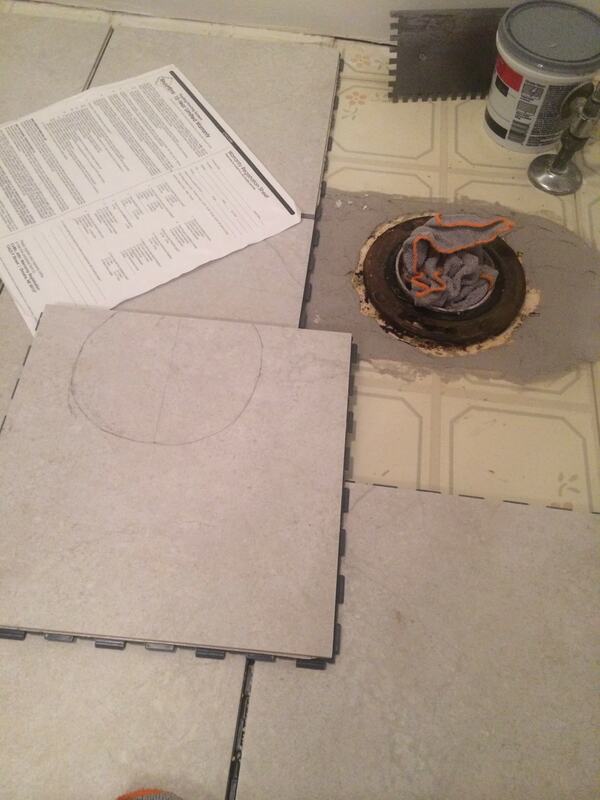 It’s seriously the easiest floor to install! It’s real porcelain tile that just snaps into place. It went right over top of my existing 2 layers of vinyl (which could contain asbestos, so I’m not touching that stuff). The floors were badly yellowed and old. After patching some parts with concrete (read: covering up the pee with concrete patching) to even the floor out, I was ready to roll! It simply snaps into place. You just make sure it’s straight :). I worked my way all the way back to the toilet flange and supply line and then wanted to just hand it off to someone else. But nope–I had to finish! I patched to make sure the floor was even. Getting around the flange and water supply almost gave me nightmares. I dreaded it! What if I screwed it up? What if the toilet rocks? 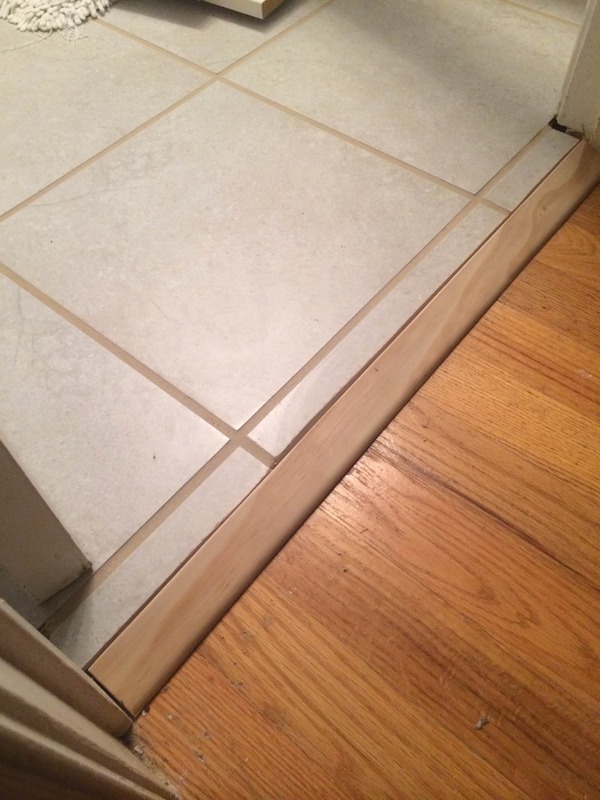 What if the tile cracks?? 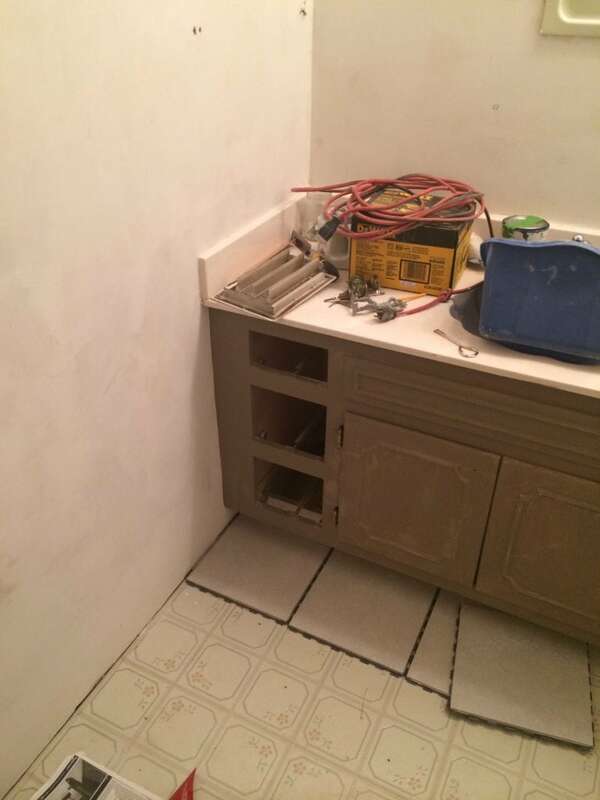 I’m going to be honest with you–don’t just look at these pictures and think I’m so handy. The truth is that it took me HOURS to measure and get these cuts right. And even then, it still wasn’t “perfect.” I’m a slow DIY’er who loves perfection but usually falls short. LOL. But it was good enough. Whew! 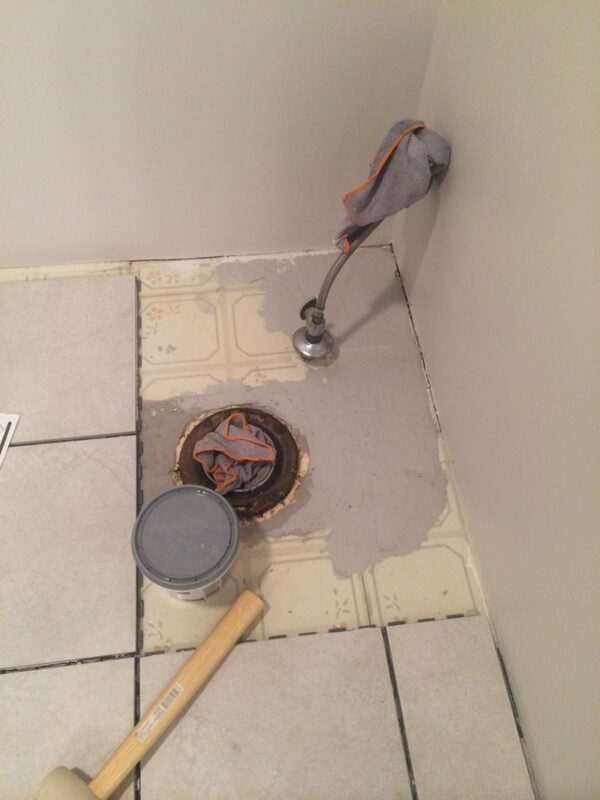 I used my angle grinder to cut the porcelain tile. 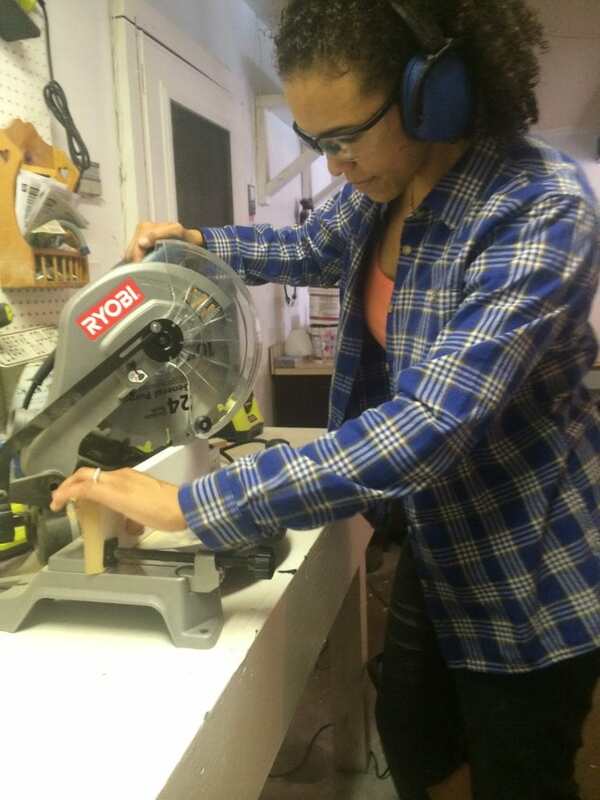 Using a wet saw is easier (I don’t have one yet, though). But for angled cuts like cutting out for a flange, you need an angle grinder. 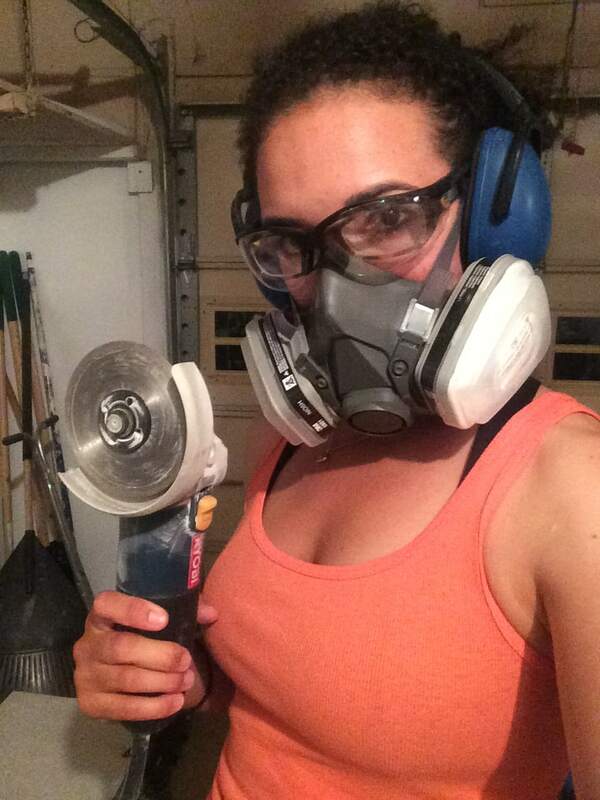 WARNING – Make sure when you’re cutting anything, or sanding anything (even spray painting) you’re wearing one of these babies! 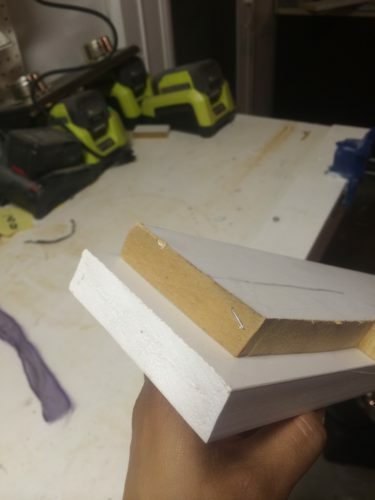 When I went to the Haven DIY conference a few months ago, Mike Holmes (yes, the Mike Holmes from Holmes on Homes did a talk about safety) said those cheap little paper-weight masks aren’t good enough. He’s right! I was using this mask while doing some spray painting and I couldn’t smell a thing. Bothers me to think all this time I have been using the small papery things and jeopardizing my lungs. No more! Safety first! It took me about 4 days from start to finish to do this flooring. Yes, 4 days. Maybe I just work slow, but when it comes to precision, I try to be as exact as I can be! I could not find a transitional piece that fit it at Home Depot!! Thankfully, they had this piece which was the best alternative I could find to a transitional piece. It was just about perfect, actually. 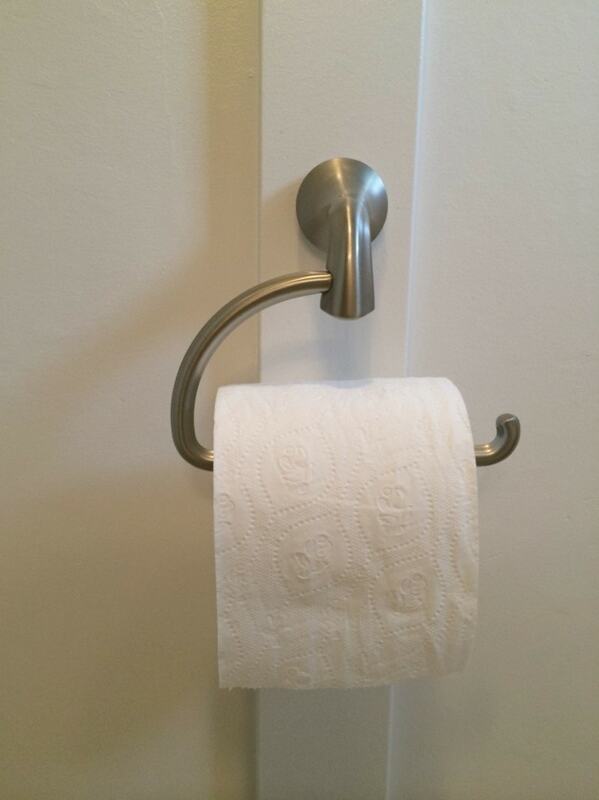 I mean, ideally, I know it should cover the edge. But this was the best I could do. 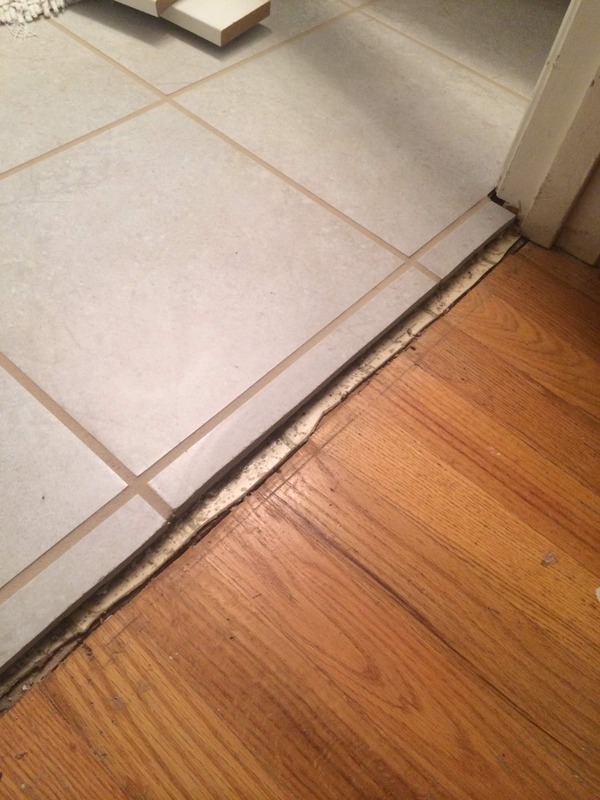 NOTE: If you’re installing SnapStone in a bathroom, be sure to caulk the bottom edges of the tile, while leaving an expansion gap. Contact the company for more info about installation. They were really helpful for me. Flooring all done! Look at those straight lines!! 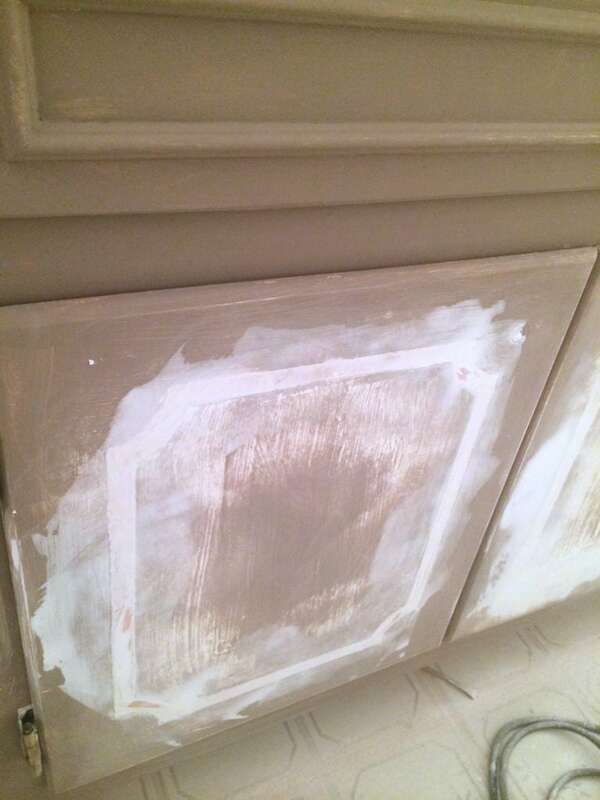 Well, since I couldn’t afford to buy a new vanity, I figured I would paint the one I owned. 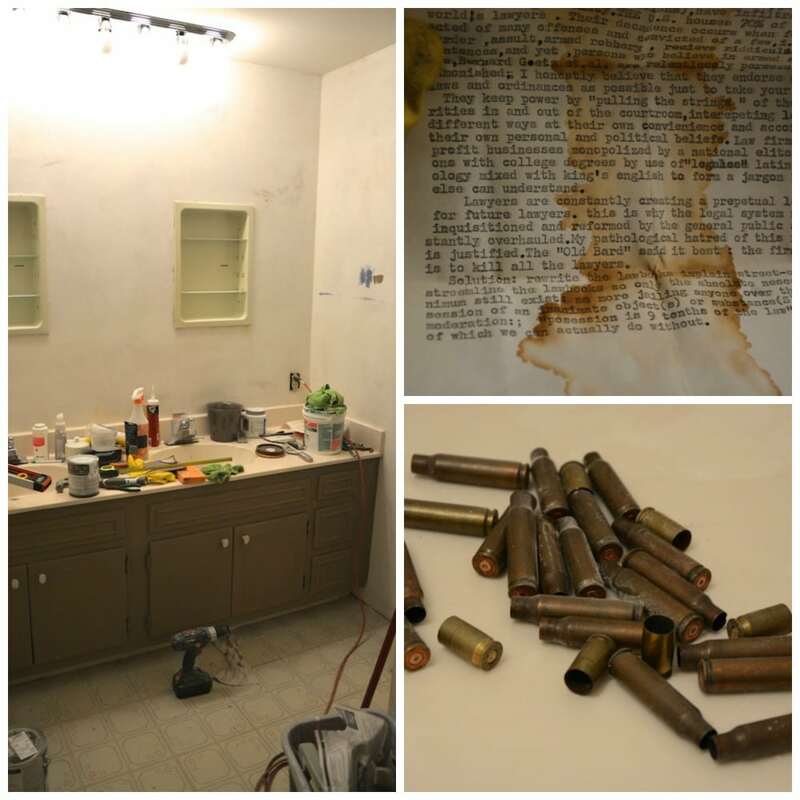 The crazy thing is that inside of this vanity, I found bullet casings and hatemail about lawyers! GASP! They seem to love it now that it’s all done, though! I Installed This Toilet All By Myself! 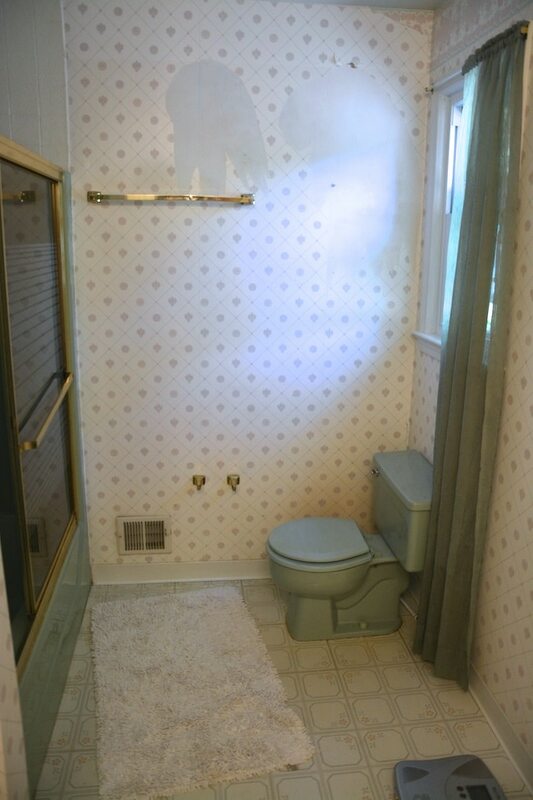 Bye-bye, green toilet from the 70’s! I’ve never taken off a toilet before and installed one. But now I can cross that off my list of “DIY Projects I Must Give a Whirl.” Hubby helped me lift it onto the bolts, but I did everything else. Woo hoo! And because it’s a 1-piece, there are no places for pee-pee to hide under the tank. It’s all one piece! 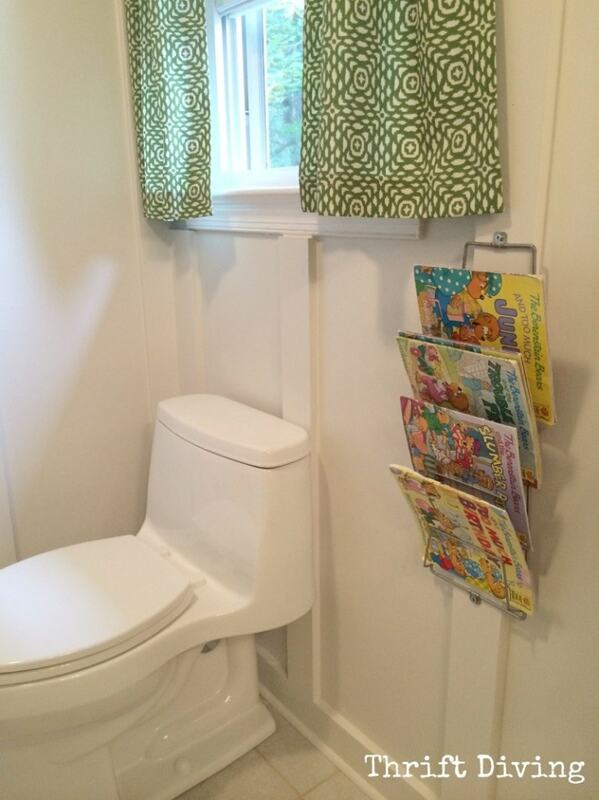 Beside it, I installed a $2.99 thrift store book holder for the kids. I also made these curtains, which some people love and others hate. But considering I already enough yardage on hand?? WIN. This compass is one of my favorite pieces of the room! 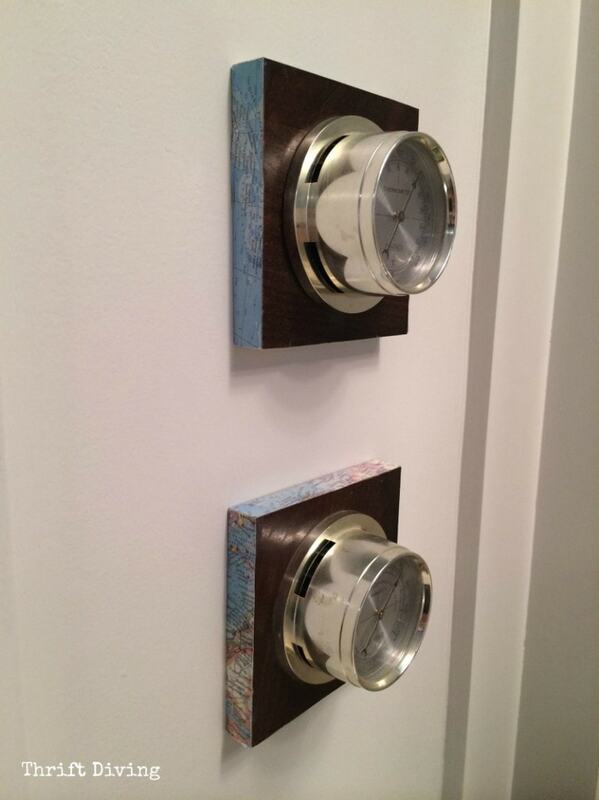 (Check out instructions on how to make this DIY compass wall art). About 8 months ago I was at a Goodwill and found what appeared to be a wooden round circle with some gift wrap paper, which later I found was an old clock. I was attracted to its roundness and knew I would come up with a good idea one day for how to use it…. I removed the innards…..cut a piece of MDF board to fit inside…..and painted the wood metallic gold.Voila!! I absolutely love vintage weather stations, too! 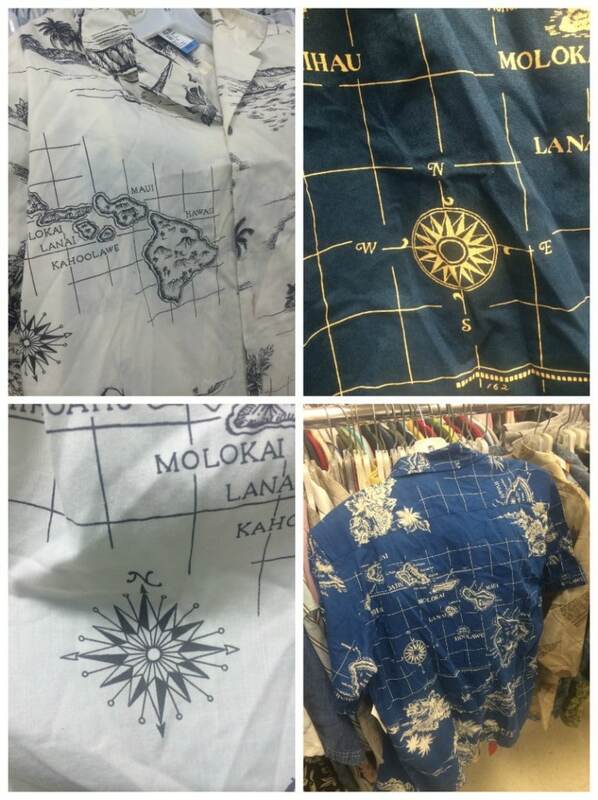 I see them occasionally at the thrift store and feel compelled to buy them whenever I come across them. I had one with 3 dials that got broken, so I cut away the “good” two that were left and lined them in a map with Mod Podge. My awesome reader Mimi sent the maps to me! Thanks, Mimi!!! One weather station shows temperature and the other one shows humidity. Love them! I love the look of board and batten. I never thought about actually installing it until I just recently become “at one” with my Ryobi compound miter saw :). 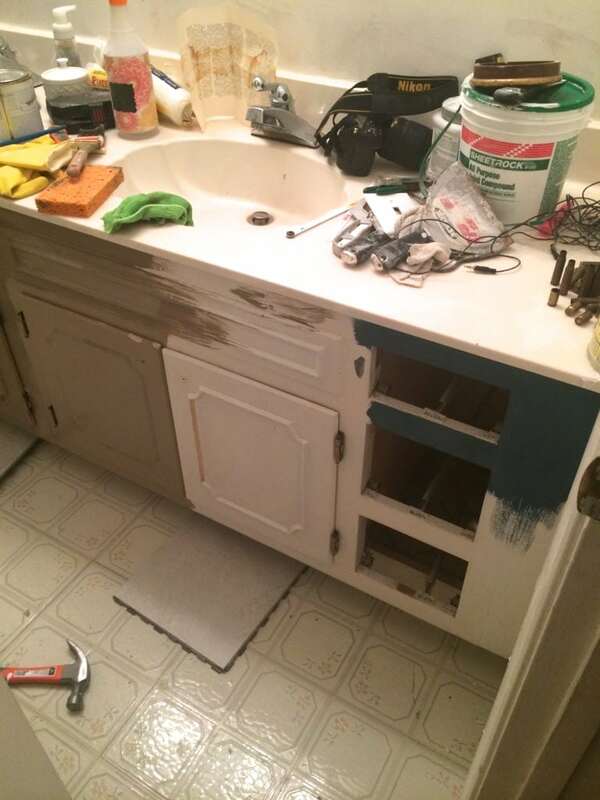 Once I overcame that fear, I knew it was a matter of time before I stepped up my DIY skillz. 1. 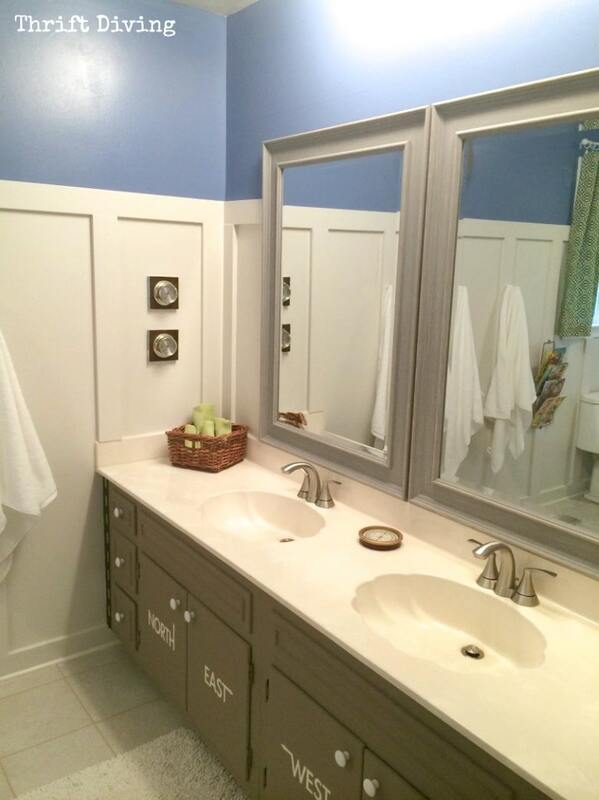 Can you use MDF boards in a bathroom? I thought “yes.” Even some guys at Home Depot said “yes” as long as it’s primed and painted in a semi-gloss (but what do they really know? I mean, seriously…). So I went and bought a bunch of MDF boards. Then my awesome reader and friend, Scott, warned me, “Don’t do it. 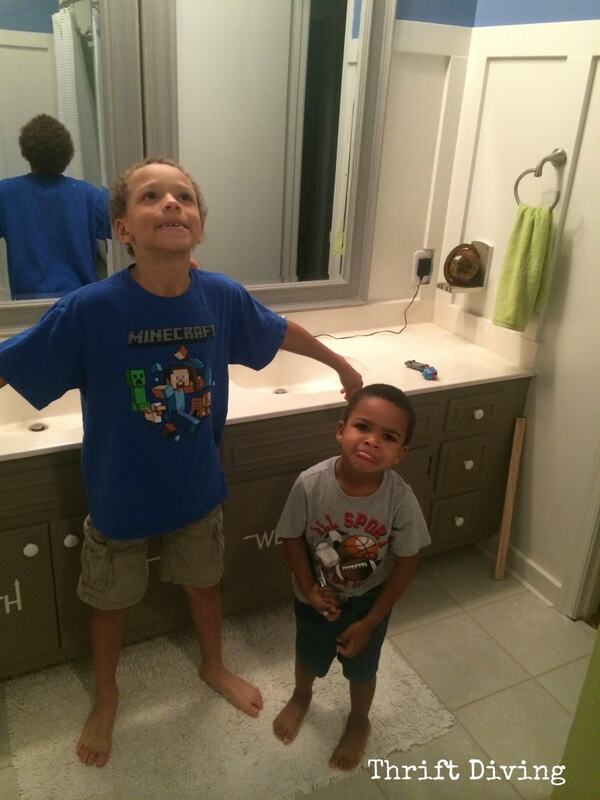 They’ll warp.” Especially since it’s a kids bathroom and they’ll be splashing everywhere. So I sucked it up and coughed up even more money for expensive vinyl boards. MDF is on top. The vinyl is the white on the bottom. But the vinyl is resistant to warping and mold and wetness. I ended up keeping a few of the MDF boards up that were already installed, but went back and stocked up on vinyl for the baseboard and most of the vertical planks. It was over $21 for a 12-foot piece. 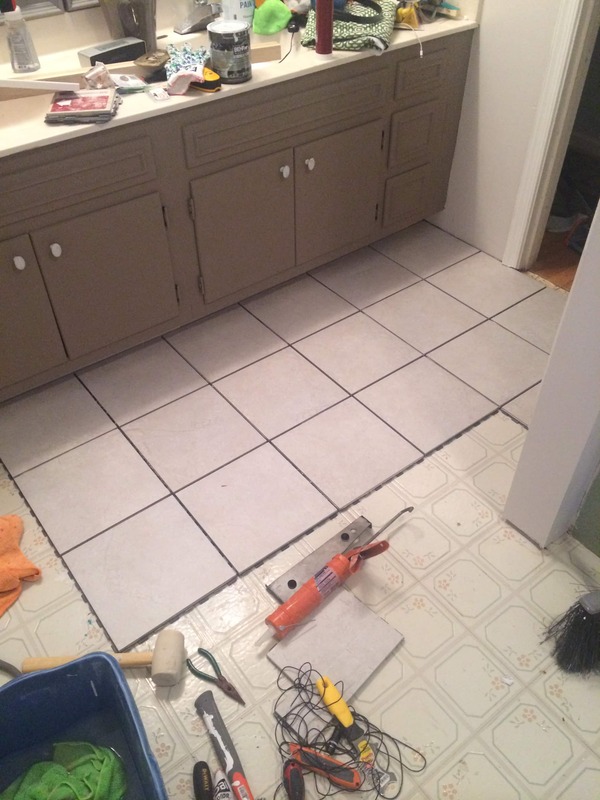 I needed about 5 pieces (about $122), but in total, to do a bathroom my size (not sure of the square footage), you need a total of about 7 boards 12-foot each. That’s about $235. 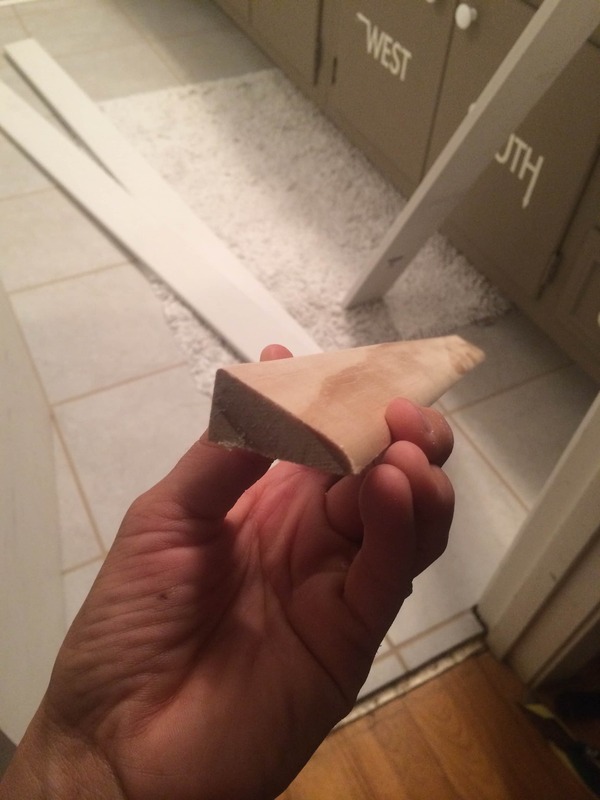 NOT cheap at all…… But just something to keep in mind if you’re doing board and batten in a bathroom. 2. How do you measure for board and batten? I’m still trying to figure this one out….But this tutorial was pretty good. Some of my boards weren’t spaced properly. But you have to look really closely to see. I also made a sign with the latitude/longitude coordinates for my city of Silver Spring, Maryland! 🙂 Love that! 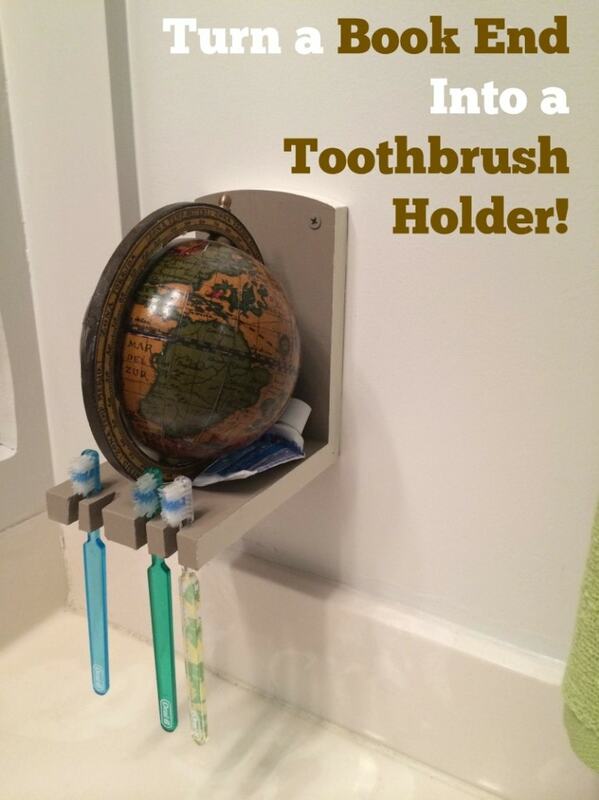 I Turned a Book End Into a Toothbrush Holder! This is one of my favorites, too! 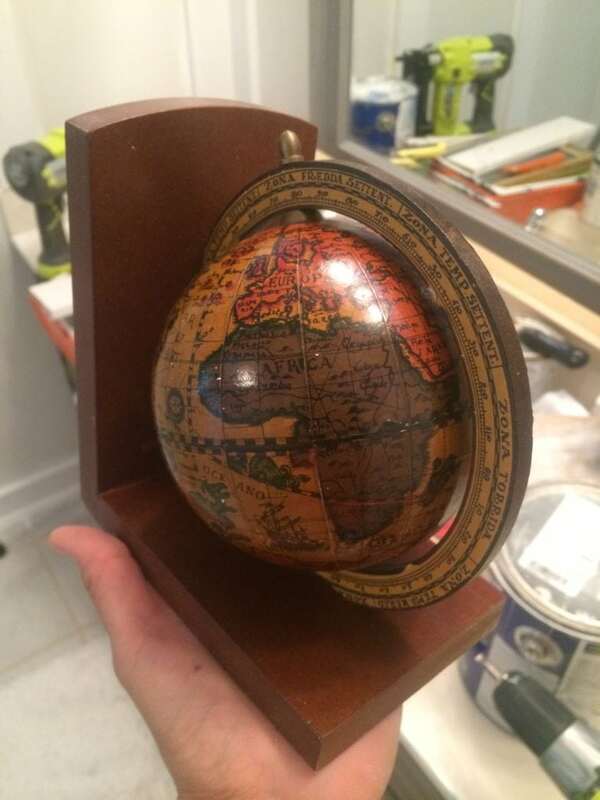 I picked up with globe bookend from the thrift store for a few dollars. I wasn’t sure how I was going to use it, but I knew I would figure something out. Also, the maps hanging came from Mimi, my reader that send them to me! They are perfect! The frames were 50 cents each from a yard sale, painted white. I got this idea at the last minute and had to “cheat” to get more time to work on it last night. In my sons’ room, I have been measuring them on the wall since we moved in nearly 4 years ago. It’s all messy and cluttered. 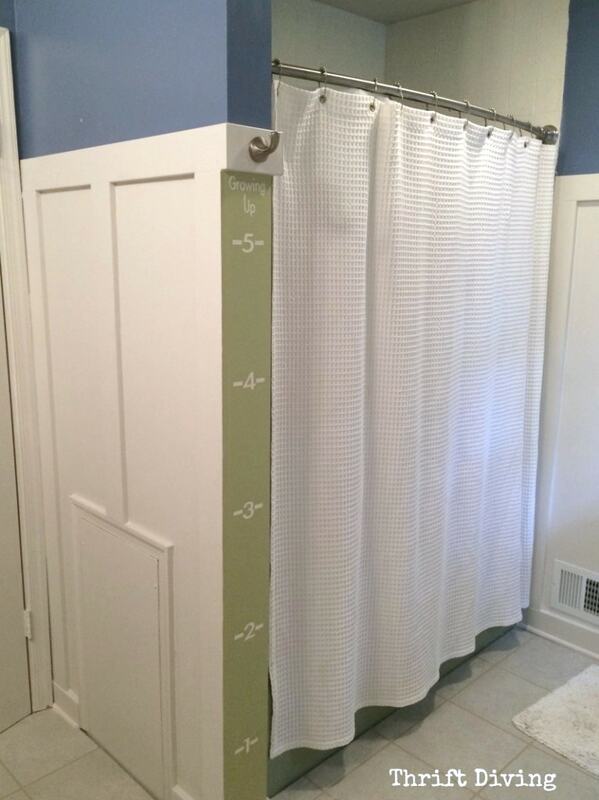 I decided to add a measurement wall to the edge of their bathroom wall! I used my Silhouette Cameo to cut the stencil out of vinyl. 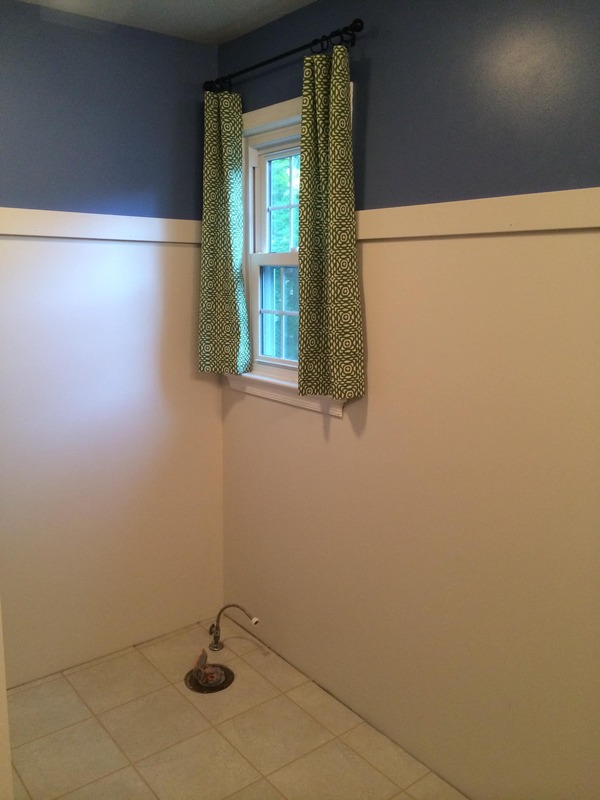 I did remove the shower doors, too. 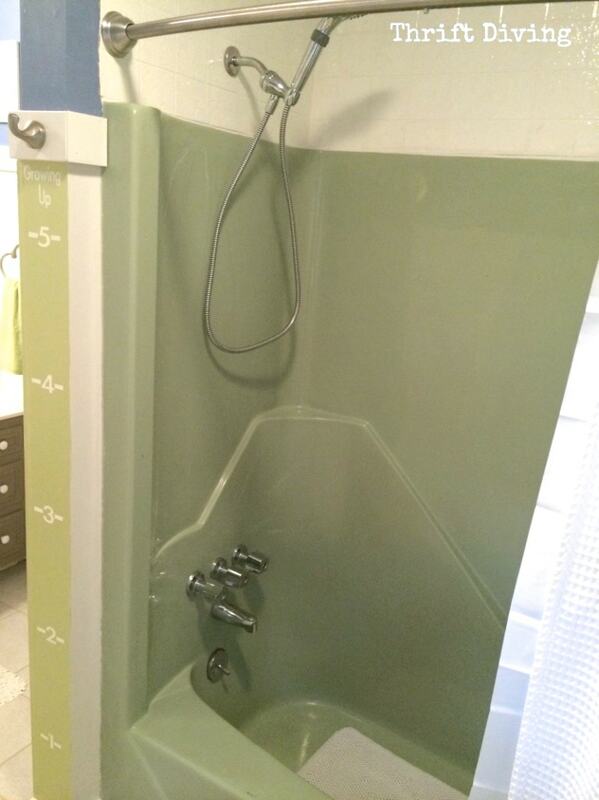 THAT was interesting…….Yep, I decorated around my shower because 1) I can’t afford to replace it, and 2) I didn’t have time or energy to paint my shower old fiberglass shower. 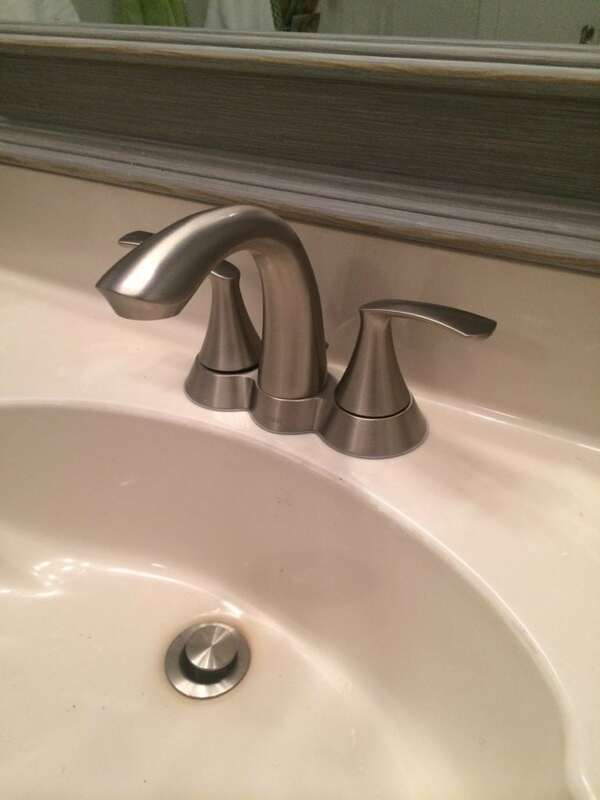 I installed a new shower head that I got for free at the Haven DIY conference this summer. It’s the Waterpik Spray Shaper with Powerspray . 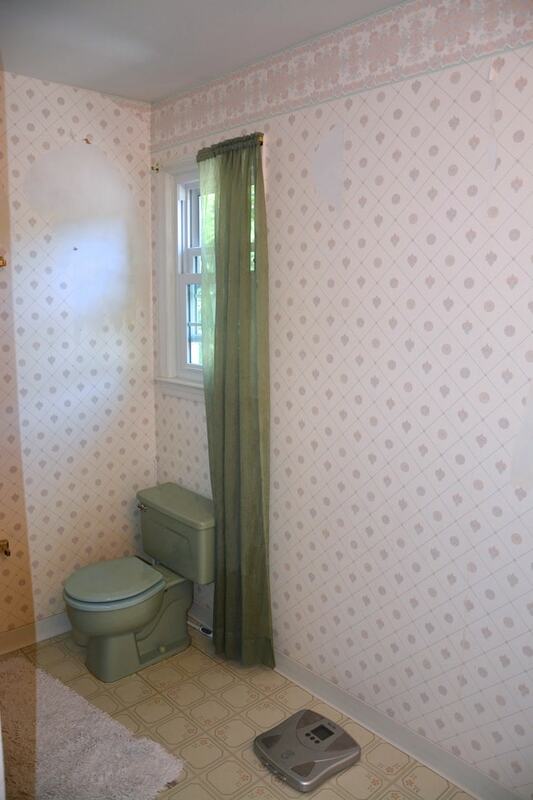 Sorry, curtain rod is covering it. 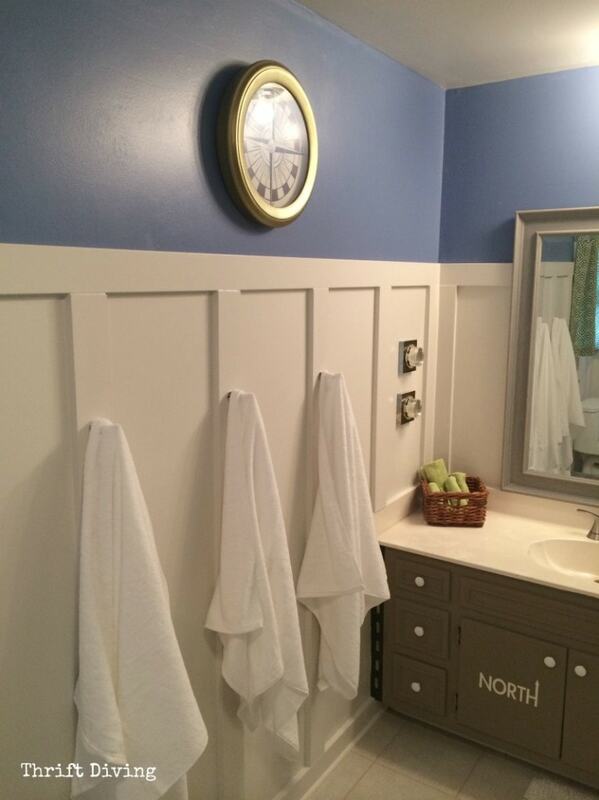 Speaking of which, the adjustable tension rod and robe hook above the measurement wall were compliments of Moen! I love them! Easy to install, too! 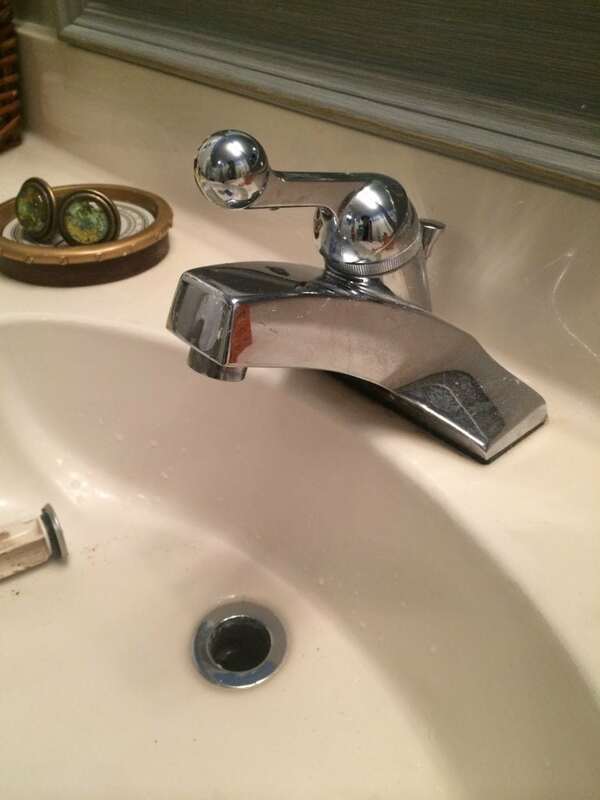 Badly outdated faucets needed to go, too. Hmmmm……This is terrible to say, but I don’t even know. It goes against everything I say about making sure you have a budget, yadda yadda yadda. But when you have no idea what you really need, you find yourself heading back and forth to the store, just to get, ahem–5 tubes of caulking at $8.00 each, all on separate days. Yes, it was that bad. I lost track. So there you have it! 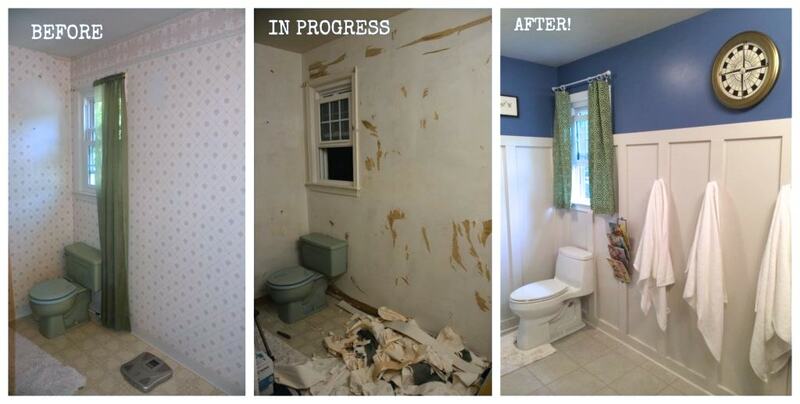 I turned an ugly bathroom with wallpaper into a kids bathroom makeover that looks fresh, updated, and fun! Thanks for checking it out! 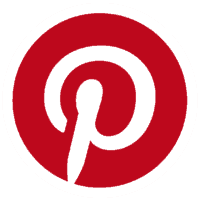 I just found your blog as I was looking for ideas on pinterest to update bathrooms. You amaze me! I’m so impressed that you just kept learning and doing. I need to quit putting things off and just dive in and learn as I go. Thanks for the inspiration! Fabulous! 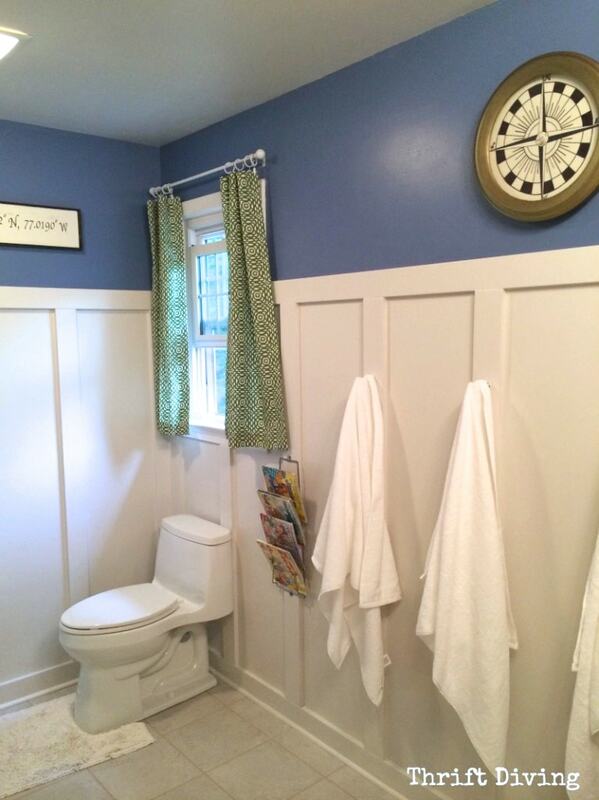 I love that it’s a “kids’ bathroom” and it definitely would appeal to a child, and yet it’s sophisticated enough to go the distance and you won’t have to redo in a few years when the child outgrows it. Stylish and smart not to mention beautifully done! WOW!!! 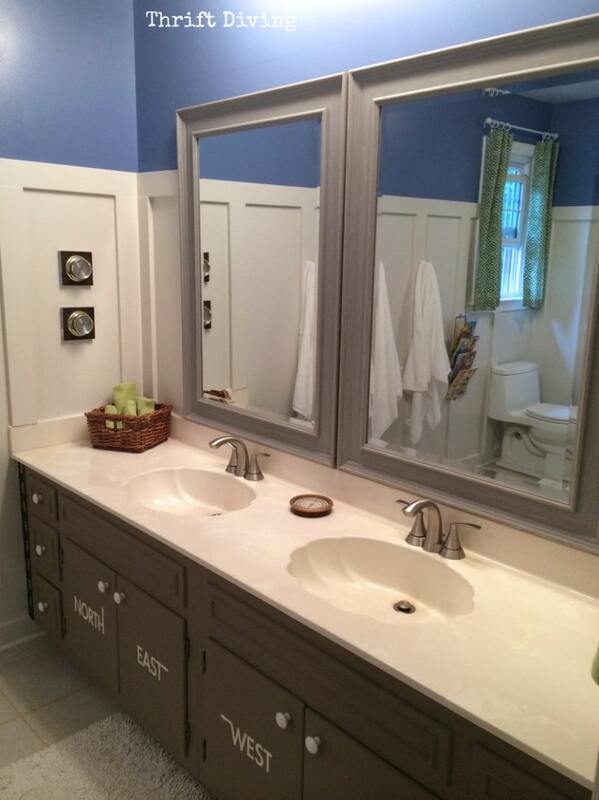 Another beautiful makeover. I love everything about this room. 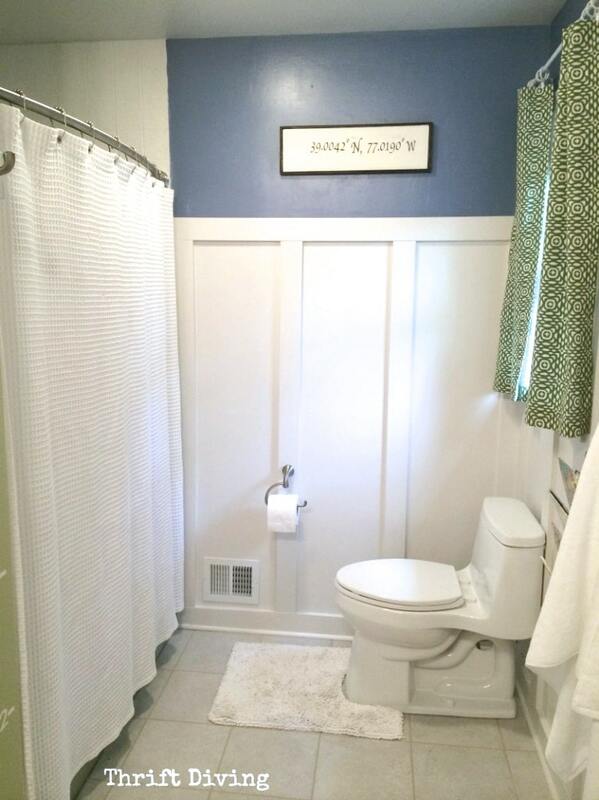 We have replaced toilets in so many of our houses, I think they are one of the easiest things to do in a home.